​​a. As a Report user, I want to construct my reports with latest barcodes available in market. Many reports require customization of barcodes in terms of direction of display, bar height, caption alignments etc. Users may also want to adjust bar width of narrow and broad bars of the barcodes. Due to some factors likes printing quality, device specifications etc, some barcode readers cannot read the barcodes correctly and hence, comes the need of adjusting the bar width of the barcodes. The 2015v2 release adds such capabilities to the Barcode Field in the form of properties to cater to the needs of customizing the barcodes. The release also adds native properties to Code 128, Code 49, DataMatrix, GS1 Composite, MicroPDF417, ​PDF417, ​​QRCode & ​RSSExpandedStacked barcode symbologies to support their general behavior and also to add more accuracy to their outputs. Users with existing reports might worry that the introduction of new barcodes can break the outputs of their old reports. But 2015v2 preserves the old barcode engine as well, with introduction of UseCompatibleBarcode property in Barcode Field. If ​a user loads his/her old reports, the property will be True by default and the old engine will be used to render the barcodes. The property will be False by default if a user drops a Barcode field on the designer. For UseCompatibleBarcode set to False, the new engine will be used to render the barcodes. Find more information on New Barcodes here. 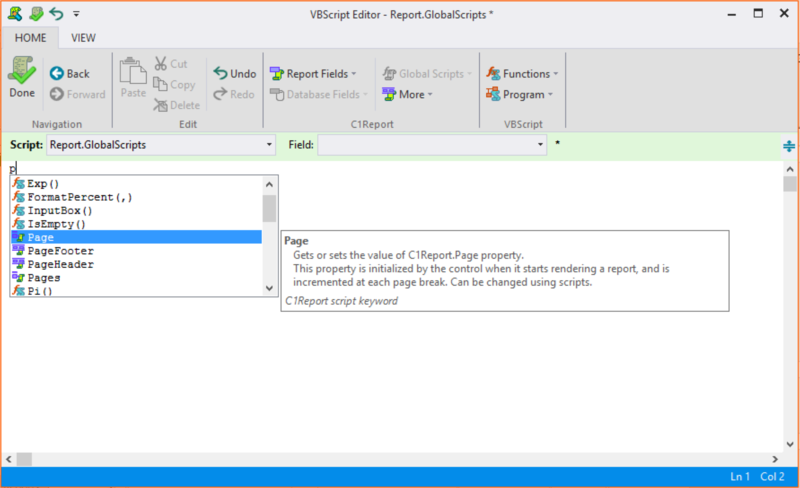 C1ReportDesigner adds Intellisense Feature to its VB Script Editor with an aim to make Report creation much easier by suggesting suitable language elements as well as Report Fields that can be inserted as you type scripts in the editor. With an aim to view multiple scripts while coding and not having to leave the editor to view code of other scripts, the addition of a new Split Window mode can help compare two of the same or different scripts together in a single frame. Keyboard shortcuts help to switch between the two views. 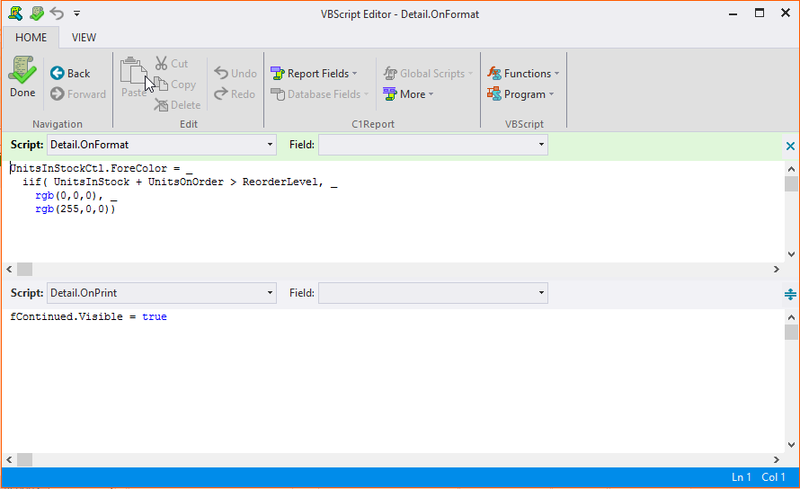 ​Please find more information on detailed features for VB Script Editor Enhancements here. A Radar chart is best suited to accomplish scenarios like above. With 2015v2, Report users can make use of this chart, to improve the plotting of data in a more neater way. b. ​As a Report user, I want to map true geographical information into Charts. A variant of Radar chart, is a Polar chart that can help accomplish the above scenario. ​​​The data for a polar chart can be given in polar coordinates (theta, r), where theta is the amount of rotation from the origin and r is the distance from the origin. With 2015v2, it is possible to plot such data using this Chart. ​Suppose a Technical support department in a company wants to improve it's response time to the customers. It has various data for the number of customers that are responded to in different time intervals - 0-1 min, 1-2 minute, etc. ​A Histogram Chart would be a perfect example of demonstrating this problem, to make inferences like, how many customers were responded to in various time intervals, and what is the average wait time for particular set of customers etc. Histogram Chart added in 2015v2, can help analyze large data sets without having to delve in to word descriptions for distinguishing each variable and their frequencies in a given set of intervals.​ This Chart becomes a powerful tool to take quick decisions based on the graphical data. There are values that remain constant for some period but experience sudden change after sometime. For e.g temperature changes of a country over different months or ranking of employees every week are some examples of above scenario. Step Chart, added in Reports in 2015v2, is best suited to plot the above data. Please find more information on the New Charts here. Previously, users had to make entries in C1ReportDesigner.exe.settings file, to use custom fields like - Chart, Map, QRCode, Gradient, SuperLabel. With the 2015v2 Release, these fields are now directly part of the C1ReportDesigner, and you can use these fields, like any other controls in the Report. a. As a user, I want to use a modern Ribbon based Preview control to load my reports as per latest trends. Till now, users have been using Traditional menu-strip based Report Viewer Controls in VisualStudio applications, but with 2015v2 release, users will now be able to use a Ribbon based Preview Control that is designed as per latest trends. 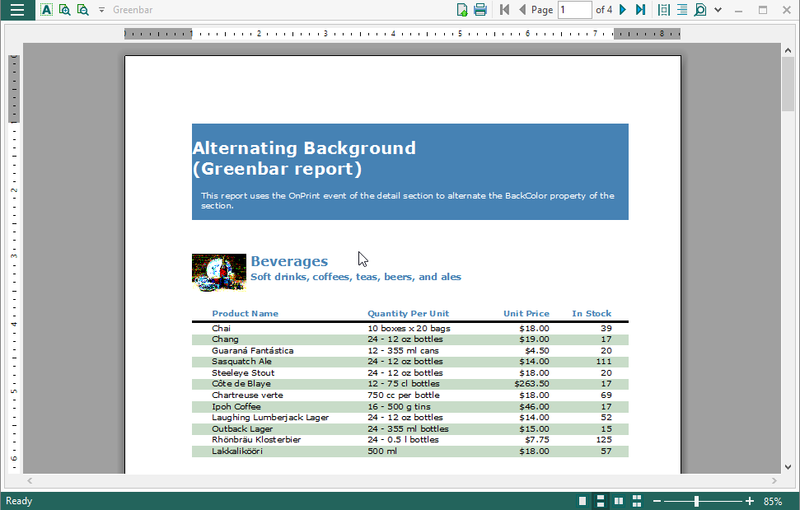 2015v2 introduces ReportPreview control for WinForms in beta version. This is a single viewer control capable of showing multiple documents, starting from C1Report to SSRS Reports, to reduce the implementation complexities for the developers who want to show documents/reports from different sources in a single viewer.​ The control will have modern sidebar, ribbon groups at par with latest trends in UI Design. In order to add this control in Visual Studio, please add C1.Win.C1RibbonPreview.4.dll in toolbox. Till now, users have been using individual viewers for every document type in ComponentOne like PDFView​er, SSRS Viewer, C1Reports etc. ​However, instead of having multiple viewers, it would be advantageous for users to have a single Document Viewer for all Document types in ComponentOne. ReportPreview control (in beta) will support C1Report, SSRS Reports & C1Document types to start with in 2015v2. Report Preview control, combines all basic features that are provided with latest Document Viewers, and presents various options for the users to navigate through their report documents. The viewer will support all the features of C1Report, SSRS & C1Document types. For more details on feature set, refer to control page at Report Preview for WinForms. From 2015v2 onwards, additional DLLs should be added in your existing projects- 1. For Winforms/Web Applications referencing C1.C1Report.4 dll, please add C1.Win.4 and C1.Win.Barcode.4 dlls to your projects. 2. For WPF Applications referencing C1.WPF.C1Report.CustomFields.4 dll, please add C1.Win.4 and C1.Win.Barcode.4 dlls to your projects. 3. For Silverlight applications referencing C1.WPF.C1Report.CustomFields.4 dll, please add C1.Win.4 and C1.Win.Barcode.4 dlls to your projects.